Supporters of the Deferred Action for Childhood Arrivals program march in Las Vegas in September. With the final renewal deadline for the Deferred Action for Childhood Arrivals program arriving today, the phaseout of the program begins for the 689,800 undocumented immigrants who are currently enrolled. Data released by the Department of Homeland Security last week paints the clearest picture yet of the people the program now benefits. And combined with information from other sources, it also offers a look at those who were likely eligible but never enrolled. The Trump administration stopped accepting new applications when it announced Sept. 5 that it would end DACA, which gives participants a work permit and a shield from deportation. But some of the people already in the program whose status would soon expire were given one month to renew their paperwork. 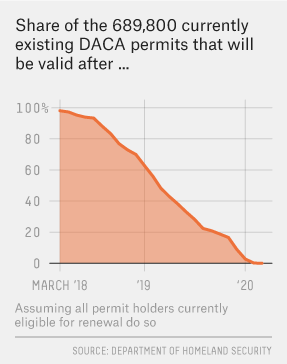 On Tuesday, two days before the filing deadline, just half of those who were eligible to renew but hadn’t already done so when it was announced that the program would close still hadn’t filed their paperwork. DACA, which began under an executive action issued by then-President Obama, was never open-ended. It applied only to a narrow group of undocumented people who have lived in the U.S. since June 2007, were under age 16 when they arrived and were under 31 in 2012. Between those and other requirements, an estimated 1.9 million people might have been eligible for the program over time if it had continued (additional people would have aged into the program as well, and some would have qualified by meeting education requirements), according to research from the Migration Policy Institute, a think tank that supports liberal immigration policies. But among that 1.9 million were nearly 400,000 people who didn’t meet the education requirements. And 228,000 more weren’t yet old enough to apply. By ending the program early, tens of thousands of teenagers and young adults who might have become eligible were never able to apply. Still, there are hundreds of thousands of people who are currently eligible but never took advantage of the now-shuttered program, and the application rates vary dramatically by country of origin. 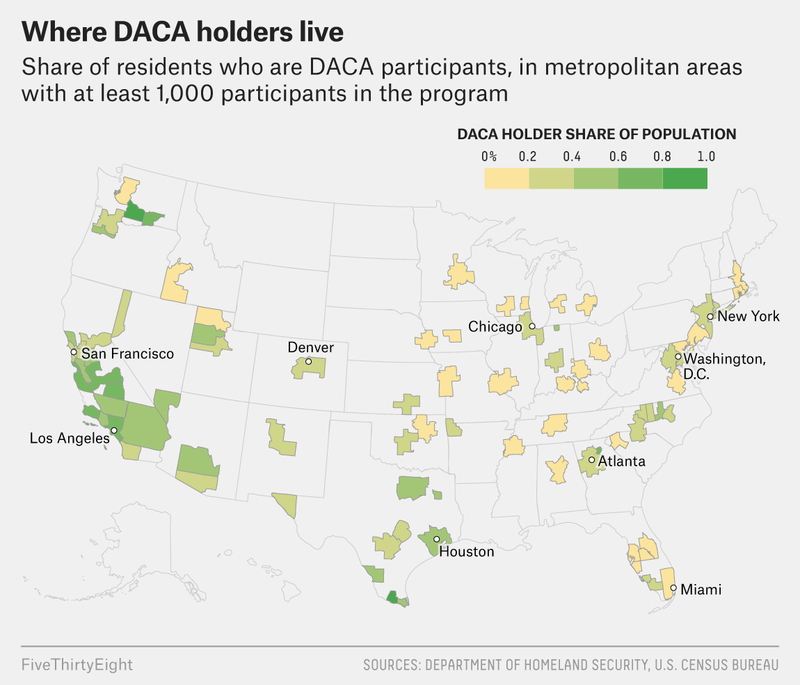 While more than 65 percent of people born in Mexico who were eligible for the program in 2016 currently have DACA protections, just 3 percent of those from China do. Generally, application rates overall have been much higher among people from Latin America than those from countries in Asia, though there are some exceptions. There are probably many reasons for that variation, said Michelle Mittelstadt, the director of communications at the Migration Policy Institute. The strong presence of Spanish-language media and the immigrant provider networks that grew up around some groups in the U.S. may have increased enrollment in some communities. But MPI’s research also suggests that high rates of deportation among Mexican and Central American communities may have created more urgency to enroll in the program. These numbers assume all people eligible for renewal get their applications in by the deadline.